Star Trek Props.com The Internet's premier source for information on collecting Star Trek props and costumes, as well as coverage of all major Star Trek auctions from the famous 2006 Christie's Star Trek auction, through the It's A Wrap Star Trek auctions on eBay and the Propworx Star Trek auctions. 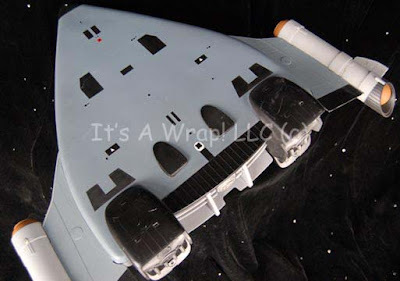 Star Trek Props is the best source for information of collecting original, screen-used props & costumes. I am a regular contributor to StarTrek.com and got to write an article on the eBay auctions that was published yesterday. I republish it here. 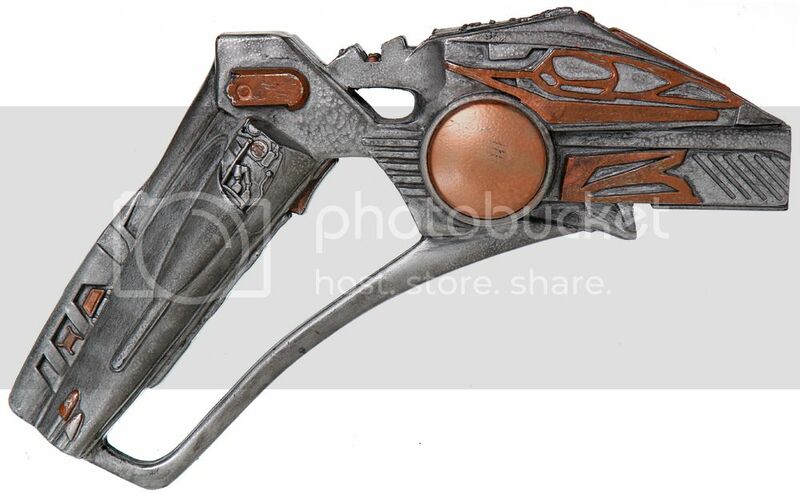 So you want to take the plunge and buy your first screen-used Star Trek prop or costume? 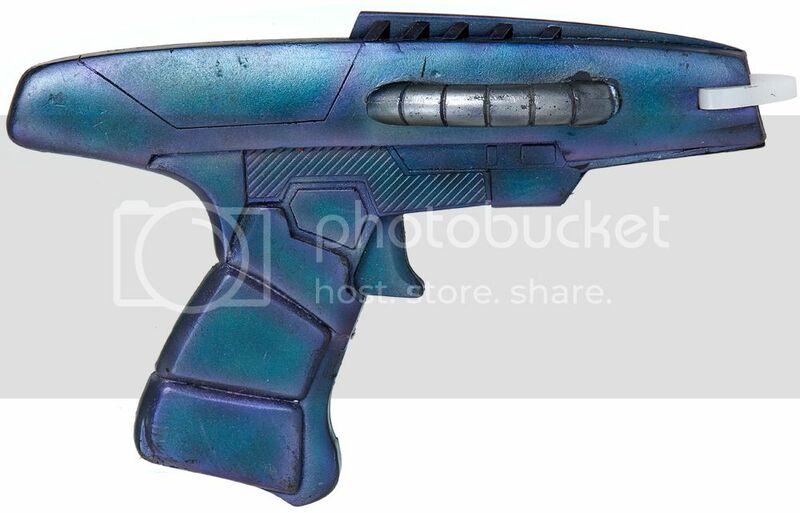 Well, now is your chance, as one of the biggest collections of real screen-used props and costumes, from StarTrek.com contributor and well-known Star Trek archivist Alec Peters, is up for sale on eBay. Alec tells the story of how he came to decide to sell his collection here. I have been a Star Trek fan for as long as the show has been on the air. In 2006, I attended the famous 2006 Christie's Star Trek Auction, and there bought my first two costumes in what would become one of the larger Star Trek screen-used prop and costume collections in the country. I won a Captain Kirk costume and a Captain Sisko costume. My two favorite captains. After that I started buying more props and costumes in the eBay auctions sponsored by Paramount and my collection grew and grew. It quickly eclipsed my meager retirement account as my single largest asset. 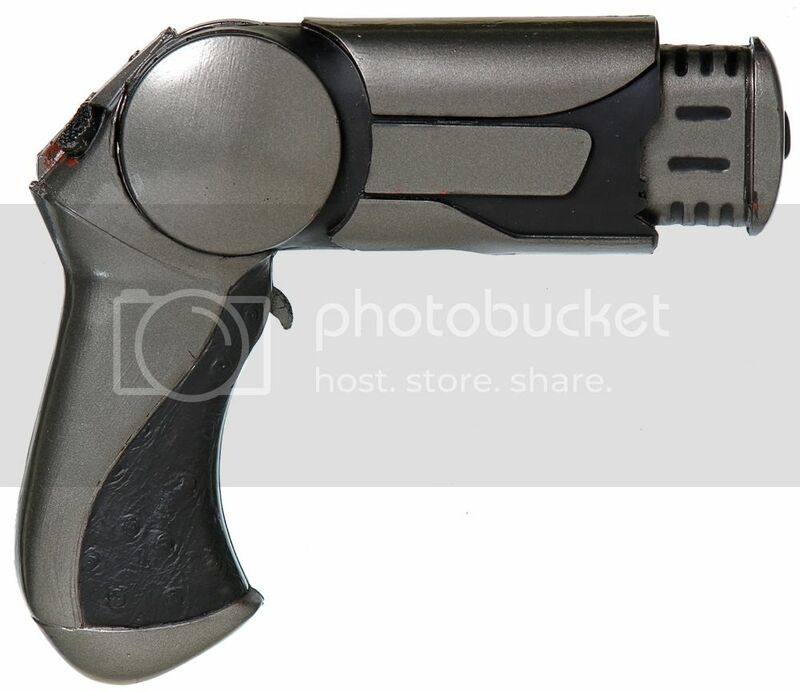 In addition, I started writing www.Startrekprops.com, the most popular website for collectors of Star Trek props and costumes, and I have been writing the blog for six years now. In 2008, I started Propworx, a company dedicated to selling TV and movie screen used props and costumes, and was fortunate enough to handle the auctions for some big-name properties. I sold the collections of Star Trek legends Mike and Denise Okuda and Doug Drexler. My love for Star Trek and preserving the history of the show was even tapped by CBS, and I now assist in preserving and cataloging the extensive CBS collection that is part of the Star Trek exhibit that travels the world. And while my collection has brought me new friends, new experiences and even a new business, it is still an asset and worth a lot of money. Now, one of the reasons I was able to spend so much money on these wonderful items, is because I am single and have no kids. But over the past three years I have become very close to my best friend Damaris and her two little six-year-old boys. She is a single mom, and like many, struggles to make ends meet. I love the boys and treat them as my own and visit them every 5-6 weeks (I live in California and they live in Orlando). And so I decided recently that I would sell a big part of my collection and buy them all a home. We found a great townhome a mile from the boys’ school and it is being built now and they will move in in April. Damaris, Justin and Ethan in the new home as it is being built. So I went through my collection in November and decided what of the 100+ props and costumes I own, I wanted to sell. I am paying cash for the house and so I started by selling almost everything that wasn't Star Trek in my collection. I then went through my Star Trek list and set aside about 50% of the collection to sell. This would still leave me with a core collection that I could be proud of, but also raise enough money to buy the house. The toughest part was deciding to sell my Deep Space Nine props and costumes. I have one of the most-complete collections of items from this show and one of every costume from each alien race in DS9. I decided to sell my Klingon, Breen, Jem Hadar and Romulan costumes, along with pistols and rifles from each of these races. I had all of these on display in my house in Atlanta, but being that I live in a small apartment in California now, I can't display any of them! So it made sense to move them to new homes… possibly even yours. It isn't often collectors get the chance to bid on so many rare props and costumes. All the props and costumes are in amazing condition and come from the most-trusted sources, so you know they are in fact direct from Paramount and are real screen-used props and costumes. The prices will vary from a couple hundred dollars for some of the hand props to several thousand for some of the better costumes. But where else will you find the Klingon assassin's knife from the TNG episode "Firstborn" or Sisko's briefcase from "Homefront" or Beverly Crusher's naval costume from Star Trek Generations? Plus, since I am not closing on the house til April 1, I am giving buyers 60 days to pay, so you can manage your budget better. I still have a wonderful collection of costumes, including one from each of the five captains, as well as Garak, Carol Marcus, Tasha Yar, Kor and, recently, Trelane's hero costume from "The Squire of Gothos." 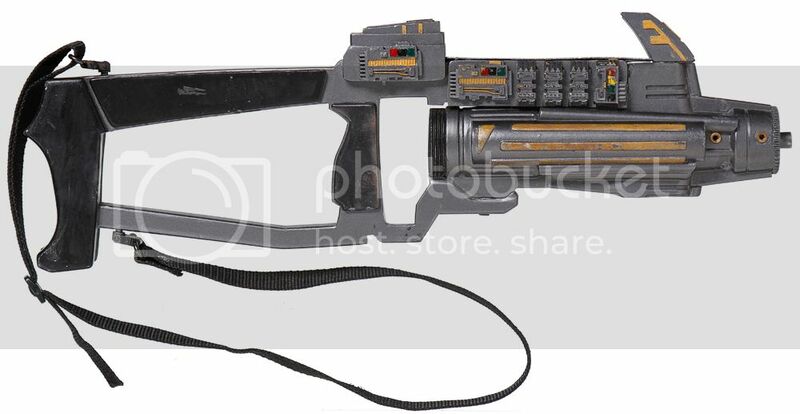 I have almost every Starfleet phaser and phaser rifle and the most-complete Klingon disruptor collection out there. So I have a lot of items to love and display. And more importantly, my favorite family will have a new home. Life is good. The first week ends tonight (Wednesday) and more items launch today as well. So today let's take a look at the props I am selling. 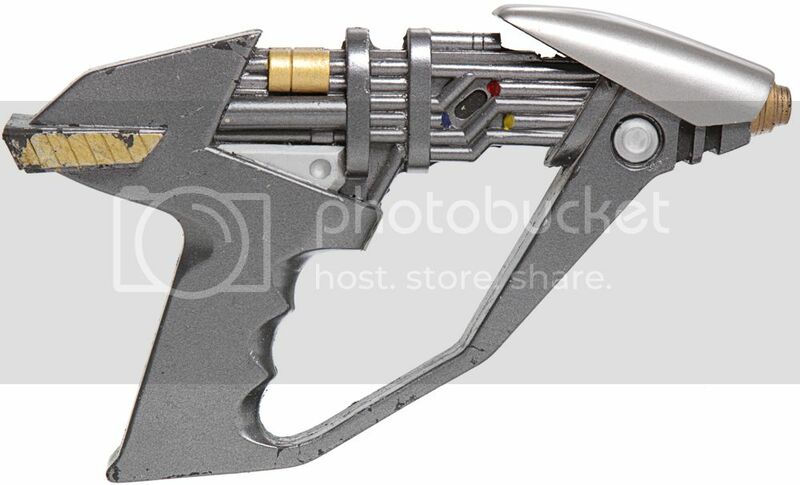 Between this week and next I am selling a whole host of weapons, both guns and bladed, including many of your favorite Klingon Weapons. There are more props being listed tonight. Thanks for all your bids! Well, I say "The Alec Peters Collection" rather tongue in cheek as I always kind of find it humorous when a person's collection gets named after them. Unless you actually donate it to a museum, it is just a collection of stuff! But, people know me and know I collect the good stuff, so I will risk the arrogance of the sound of the title. As many of you know, I am buying a townhome for my best friend Damaris Degen, and her two AMAZING little boys, who I basically treat as my own. Damaris is a single mom and I thought what better way to show my love for all of them than to get them a place they can call home forever. And so I am selling about 40% of my collection so I can pay cash for the place. Thank God the property market in Florida is soft. 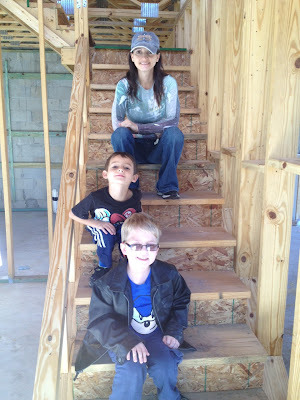 Here is Damaris and the two boys in the townhome as it is being built. So now to the brass tacks! All items are being out on eBay. Some are being sold direct, so if you have seen my list, you may make an offer. The first 10 costumes are up now and end Tuesday night (tomorrow). The first 10 props are up and end Wednesday. There are another 10 props going up tonight. All items are under user name Linnear. All props & costumes come with either a It's A Wrap, Profiles or Propworx COA. Ask me any questions you want. I note in each auction ad what the provenance of each item is. Since I don't close till the first week in April, I am giving all buyers 60 days to pay. Pay 25% down and 25% every 3 weeks. All amounts are due by March 31st. The Breen costume is the best of the lot. Only 3 complete Breen costumes have been sold. A complete Klingon Costume. It has the rare black boots. Most Klingon costumes come with the boots that were painted brown for Enterprise. A TMP Class B costume. Tomorrow I will post photos of the props. Well, we have been digging into the Captain Archer model on eBay and the seller has responded to David Solomon, the buyer of the $ 10,837 version from IAW, and he even sent me an email with a photo. So, the seller has TWO Archer models, and he won the lot of the Remote Control and anti-grav device on the archive here. 1) Why are you using photos of the model that are not yours? 2) Why not use a photo of the listing for YOUR model? 3) Why do you not show a full image of the COA? 4) Which model is this? But the big question is, where did these come from, and which one is the one with the COA that as been restored. Because the photo above CLEARLY shows that it only had one nacelle and there are ONLY two of these in the auction archive. More questions need to be answered. This is all about clarity and precision. Well, it has been two months since I posted, and it is time to get back into it! So before I complete my "Integrity and Authenticity" article, I thought I would get up some info provided by Star Trek Prop, Costume & Auction Forum readers on an eBay item. Captain Archer's Model Spaceship from "Broken Bow"
This seller is trying to sell a model that is NOT what he claims. Now the model on eBay is NOT this one from IAW that sold for $10,837. Yet the seller is trying to pass it off as that one (for obvious monetary reasons). We know that because that one is in possession of a respected forum member. But the seller uses those photos and is clearly trying to fraudulently represent the piece as that one. And the pics don't match! He even uses the old IAW eBay auction ad! Note he HIDES the photo so you dont see the single broken off Nacelle. Why would you put the COA under the model unless you are trying to hide something? 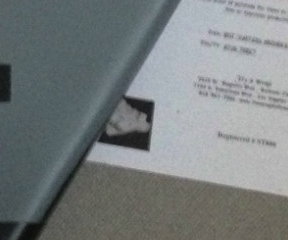 Note that this is the photo on the COA in his photo. You can tell by the way the model is photographed and by how part of the photo is under the model. The seller is CLEARLY trying to hide the image. But IAW always used a photo from the ones they had in their auction ads. These models do not match. It is also unclear if the model he has is restored, or if it is a different model. Either way, it is NOT the one that sold for $ 10,837. Note the lack of black paint in the center, the lack of stripe on the side of the fuselage at the wing root. Two totally different models. 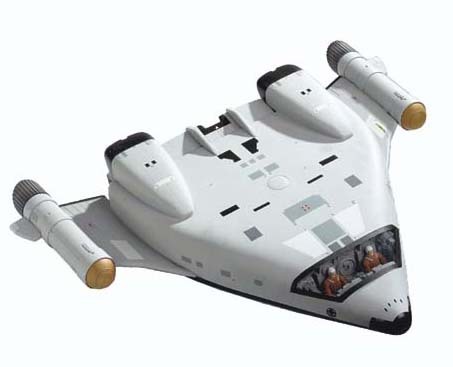 Note the center section between the engines is different. But this is the other model sold by IAW (sold for $ 1,404). So it APPEARS that he took this model and restored it. Maybe when reassembling it, he took the rear black piece and put it back upside down. That is why it is grey on the bottom, while the grey should be on the top. The other possibility is that this is ANOTHER model. But if so, why is he using the COA from the one that sold for $ 1,404? Is he trying to switch the COA onto another model? That is fraud in and of itself. What we know for sure it is NOT the one that sold for $ 10,837. And we know for sure this seller is attempting fraud. And for Reference, this one sold through Christie's, lot # 167. More to come I am sure. The listing shows your purchase as a reference for valuation .It was bought by you at that price ,at that e-bay auction.Your purchase was not fraudulent.I am not selling yours nor do I reference yours as the one for sale. I bought mine, the one that is for sale, from the same people you bought yours from . Hope its cleared up. The fact is the seller IS trying to defraud people by using photos that are NOT of his model. Seems by my email, people agree.